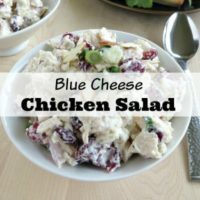 Easy Blue Cheese Chicken Salad | Quick and Delicious! I love blue cheese! It adds so much flavor to any dish. 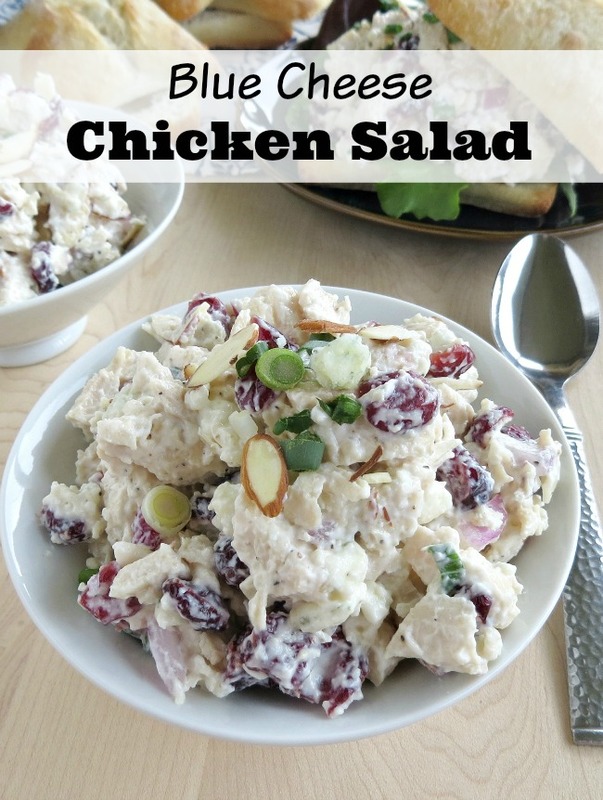 It’s especially tasty in this quick and easy chicken salad recipe! 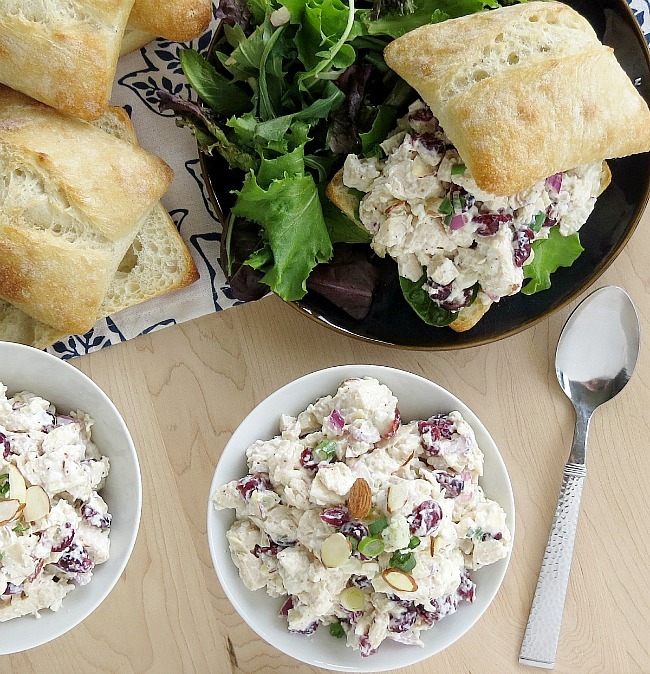 The blue cheese pairs well with the cranberries and almonds, creating a flavorful chicken salad with a bit of crunch! 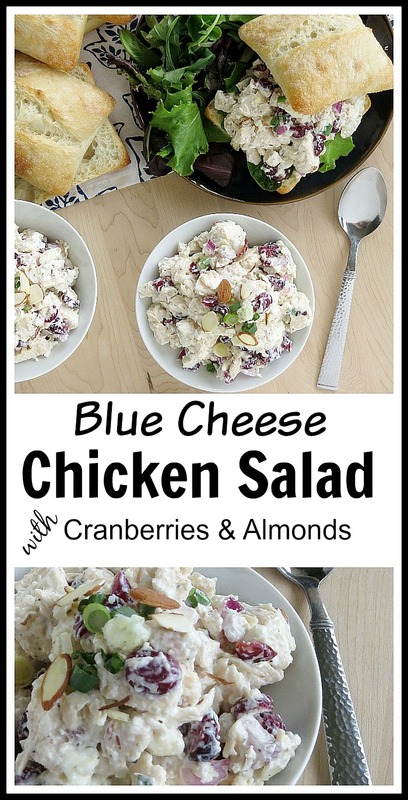 If you’re looking for an easy summer recipe, or want something quick and easy to make for a gathering, then you should check out this Easy Blue Cheese Chicken Salad! This would also be a great recipe to use up any leftover rotisserie chicken you may have! 1. In a large bowl, combine the chicken, blue cheese, cranberries, almonds and onions. Stir to combine. 2. In a separate bowl, combine the yogurt, mayonnaise, vinegar, and honey. Whisk until smooth. Taste and adjust the salt and pepper to your liking. You can also add more of any of the other dressing ingredients at this point. 3. Pour the dressing over the chicken and veggies and gently stir until thoroughly combined. Taste and adjust all of the seasonings again. Serve with rolls for sandwiches, over a bed of lettuce or as an appetizer. To serve as an appetizer, you can top crackers, sliced cucumbers, or homemade tortilla cups. To make the tortilla cups, simply use a biscuit cutter to cut out rounds, lightly brush both sides with olive oil, and bake at 400 degrees until brown and crispy. You can use different size biscuit cutters to make different size cups, as seen in the photo. This is a quick, simple, and delicious summer recipe! 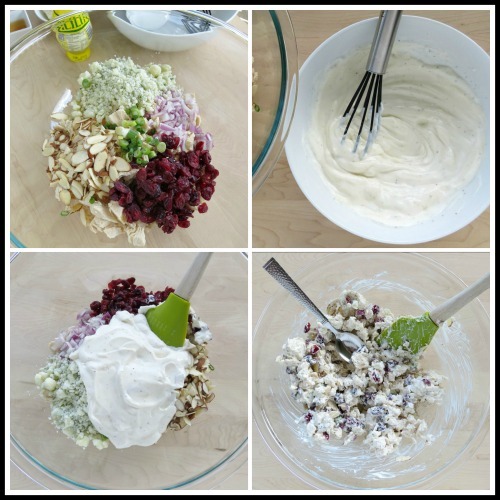 In a large bowl, combine the chicken, blue cheese, cranberries, almonds and onions. Stir to combine. In a separate bowl, combine the yogurt, mayonnaise, vinegar, and honey. Whisk until smooth. Taste and adjust the salt and pepper to your liking. You can also add more of any of the other dressing ingredients at this point. Pour the dressing over the chicken and veggies and gently stir until thoroughly combined. Taste and adjust all of the seasonings again. We LOVE blue cheese:) I can’t wait to try this recipe! Have a blessed day dear Manuela, HUGS! Sounds delicious! We love blue cheese too. OK, I have to share with you some frugal things I’ve done lately. I thought of you as I slogged through the process. 1. Called AT&T and negotiated a much lower monthly bill for Uverse. Saved about $45 and increased the quality of our internet. 2. Changed home monitoring companies to save about $20 per month. 4. I’ve been using the Walmart Price Catcher app faithfully. Don’t love Walmart but I do love the savings. Seems like there’s something else too. Anyway, I’m putting the savings towards our mortgage. Hi Stacy, That is so great! Those are some wonderful savings! I’m not fond of Walmart either and my saving catcher doesn’t really save me a whole lot. I often think that the Target Cartwheel is a better system. Have you tried ibotta for groceries yet? Oh yum, this chicken salad looks so delicious. I love little bits of blue cheese; never thought of pairing it with chicken. Will be pinning this recipe! Thank you for taking the time to share your awesome recipe with us at Brag About It! 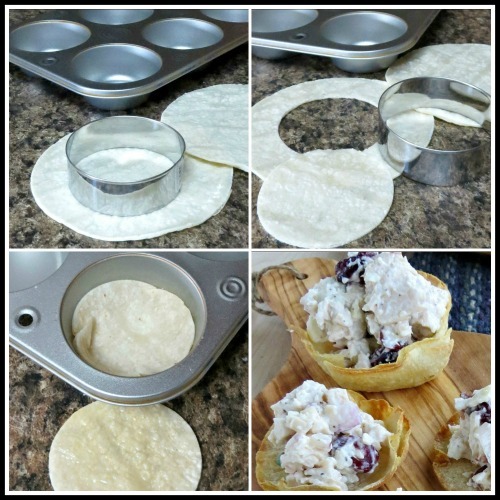 This is great idea, and I love it in those tortilla cups. Thanks for posting. Hello from Busy Monday.